The rotator cuff is made up of a group of four muscles and their corresponding tendons, which are connected to the scapula (shoulder blade) and the top of the humerus (upper arm bone). The tendons run underneath the acromion, a bony protrusion at the top of the shoulder blade which curves over the rounded head at the top of the humerus to meet the clavicle (collarbone). What is the function of the rotator cuff? The rotator cuff helps to lift and rotate the arm, and aids in stabilization of the shoulder joint. The rotator cuff is active in everyday activities we often take for granted, such as brushing our hair. A rotator cuff tear occurs when any of the tendons which make up the rotator cuff detach and retract from the bone at the top of the humerus. The tear can incorporate more than one of the tendons or a single tendon. Rotator cuff tears can either be acute or chronic. 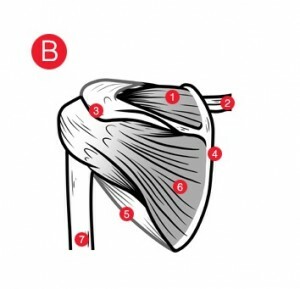 What is the difference between acute and chronic rotator cuff tears? A rotator cuff tear is usually classed as acute if the injury happened suddenly, and chronic if the tear has developed over a long period of time. What are the main causes of acute and chronic rotator cuff tears? 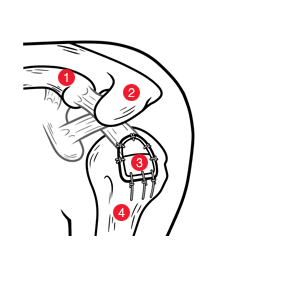 Acute rotator cuff tears can be caused by a sudden excessive strain or trauma on your shoulder. Such strain or trauma could be caused by lifting something heavy above your head, or by falling directly onto your shoulder. Acute rotator cuff tears can often happen at the same time as another injury, such as a fracture or dislocation of the shoulder. Chronic rotator cuff tears are injuries which have developed over a long period of time, and are more common than acute tears. Chronic rotator cuff tears are generally prevalent in people over 60 years of age, and one of the most common causes is simply the degeneration, or wearing out, of the tendons due to age. Poor blood supply to the tendons, or the rubbing of the tendons against the bone of the acromion over a long period of time can also contribute to degeneration. Some other causes include overuse of the rotator cuff over a long period of time, for example in activities which involve repeatedly raising your arm over your head. This could be in certain occupations such as painting/decorating, or in sports such as swimming, tennis, kayaking or cricket. Certain lifestyle issues such as smoking can also increase the likelihood of a tear, as tobacco and nicotine have been linked to poor blood supply as well as poor wound healing after surgery. Conservative, or non-surgical treatment, generally takes the form of gentle physiotherapy to strengthen and stabilize the muscles of the damaged rotator cuff. Non-steroidal anti-inflammatory drugs (known as NSAIDs) may be prescribed to help relieve pain. As rotator cuff tears are most common in people over 60, who generally tend to be less active, conservative treatment is often offered before surgical treatment. In some cases, for example where the patient does have a particularly active lifestyle, or where previous conservative treatment has failed, surgical treatment may be preferable. Although ultrasound or MRI scans of the rotator cuff tear may be performed prior to surgery the full extent of damage, including muscle and tissue quality, can only be properly established upon arthroscopic inspection of the shoulder in the operating theatre. To do this, the surgeon will make a series of very small “stab” incisions in the shoulder and insert a telescopic camera on the end of a long thin tube, which is known as an arthroscope. If the tear is relatively small and the tissue is of good quality it can usually be repaired arthroscopically, without the need for any further incisions. However if the tear is large or the tissue has undergone degeneration the surgeon may need to make a larger incision and perform “open” surgery. Although small and medium tears (less than 3 cm in diameter) can usually be repaired effectively using standard surgical techniques, some of which are listed below, large and massive tears are not always fully repairable. Incomplete repairs, where it has not been possible to fully reattach the tendon to the bone, are at high risk of re-tearing. For more information about typical surgical techniques for different sized rotator cuff tears, please see below. Sutures are thin sterile threads, commonly made from silk or polymer materials, which are used to reattach the tendon to the bone from which it detached. They can be used in conjunction with suture anchors which, as their name suggests, are designed to anchor the sutures in place. The anchors incorporate a small hole or eyelet through which the suture thread is passed, and typically have a screw or rawlbolt fastening which allows them to be fixed to the bone. The suture threads are then knotted to secure the repair. Sutures and anchors are generally used for small or medium rotator cuff tears. Clinical results when used for large and massive tears are not good. If the tissue has undergone degeneration and is weakened the sutures, which are strong but thin, may be at risk of cutting through the tissue like cheese wire and jeopardising the repair. Some suture threads can also be quite slippery, so may need to be secured with more than one knot. Knots which are large or stacked may also be at risk of irritating or cutting through the soft tissue. 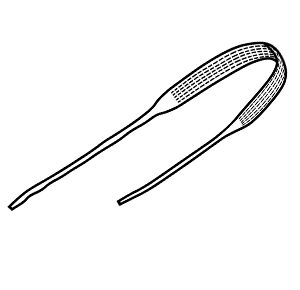 Patches are designed for use in conjunction with other surgical techniques such as sutures and suture anchors, to add additional reinforcement to the repair. They are particularly beneficial in cases where it is not possible to repair the rotator cuff fully and a gap still remains after surgery, or in cases where the tendon has been reattached to the bone but the quality of the tissue is not good. The rotator cuff is repaired as far as possible using sutures and then the patch is applied over the top and sutured in place; rather like sewing on a patch to reinforce the knees in a pair of jeans. Depending on the circumstances, some patches may be implanted arthroscopically (using long, thin surgical instruments through very small stab incisions), while others may require an additional incision to be made for an open approach. Allograft patches, which are made from human tissue and are taken from a donor. Xenograft patches, which are made from animal tissue. The most common xenograft material is porcine tissue (from a pig). Synthetic patches, which can be made from a range of synthetic materials. Neoligaments’ Leeds-Kuff Patch is made from polyester. Please see below for more details on this particular device, including its specific benefits and how it is implanted. Some patches, particularly allograft and xenograft patches, need to be soaked or defrosted prior to surgery. As the full extent of damage to the rotator cuff is only established in the operating room, this can potentially make them quite an expensive option, as once they have been soaked or defrosted they must either be used immediately or disposed of. If it turns out a patch is not appropriate for the rotator cuff repair, the allograft or xenograft patch must still be paid for. There is also a risk that the allograft or xenograft tissue may be rejected by the patient’s body. In cases where the rotator cuff tear is too large or the tissue is too far degenerated to secure it back to the bone from which it detached, a tendon transfer may be performed. This procedure involves partially detaching a tendon from another part of the shoulder, and “rerouting” it from its original position so that it bridges the gap between the torn rotator cuff and the bone. This is a complicated procedure which cannot be performed arthroscopically and requires a large incision. The patient may also experience weakness or loss of function (donor site morbidity) in the area from which the transferred tendon was detached. This is because the tendon tissue suffers necrosis (tissue death) when it is detached, which causes it to lose strength. Some strength is gradually regained after the operation, but this can mean a longer recovery time. Tendon transfer is often only considered if it is not possible to repair the rotator cuff by any other means. An alternative to tendon transfer for the repair of a large or massive rotator cuff tear is the use of synthetic ligaments to bridge the gap between the tendon and the bone instead of a re-routed tendon from another part of the shoulder. With a synthetic ligament the risk of donor site morbidity, necrosis, and associated weakness is eliminated, which may reduce the recovery time. There are a range of different synthetic ligaments available, each with different properties and surgical techniques. Please see below for details of Neoligaments’ Rota-Lok, which has been designed specifically for repair of massive rotator cuff tears. The Leeds-Kuff Patch has been designed specifically for reinforcement of the rotator cuff following repair by sutures and suture anchors, in cases where it is not possible to completely repair the tear, or the quality of the soft tissue is poor. It is made from polyester, a biocompatible material which has been in use for the reconstruction of ligaments and tendons for more than 25 years. As the Leeds-Kuff Patch is made from a synthetic material there are none of the risks or potential drawbacks associated with allograft or xenograft materials, which can include donor tissue quality. The knitted construction of the patch provides a scaffold which encourages new tissue to grow through and strengthen the repair. The Leeds-Kuff Patch has been designed with integral reinforcements around its perimeter and across its width, which improve the stability of the repair by reducing tension on the sutures, and thus reducing the likelihood of them pulling through the soft tissue of the rotator cuff. The coloured perimeter also ensures correct placement of the sutures to gain maximum strength and stability. The Leeds-Kuff Patch comes sterile and ready to use and there is no need to soak or defrost the device prior to the procedure, which makes it convenient and cost effective in comparison to some other patches. The shoulder is evaluated arthroscopically to determine the full extent and size of the tear. If the tear is small and the tissue healthy, it is repaired arthroscopically using appropriate sutures and suture anchors. If the tear cannot be completely repaired using normal methods or the quality of the tissue is poor, the repair is reinforced with the Leeds-Kuff Patch as outlined below. A small incision is made and the rotator cuff is repaired as far as possible with sutures and anchors. The Leeds-Kuff Patch is placed over the repair and secured using sutures, which are passed both through the rotator cuff tissue and the bone at the top of the humerus. Once the Leeds-Kuff Patch is in place, the incision is closed using sutures. The rehabilitation programme described below should be supervised by a specialist physiotherapist. All exercises should be performed within the pain free range of movement, and prescribed activity levels should not be exceeded before complete healing has occurred. The shoulder is held in an immobilizer for three weeks. During this time only passive movements, where the physiotherapist moves your shoulder for you without any assistance from you, are permitted. These may include pendular exercises and passive movements of the arm to shoulder height, both forwards and out to the side. Gentle strengthening work can commence following this, at approximately six weeks postoperatively. As rotator cuff patients often have existing muscle atrophy (degeneration of the muscles) before the operation, recovery of power and range of motion in the shoulder may take a long period of time. Neoligaments’ Rota-Lok has been specifically developed for cases of massive rotator cuff tear, where the tendon cannot be reattached to the bone by other means, and also when the cuff tissue has undergone degeneration. It is made from polyester, a biocompatible material which has been in use for reconstruction of ligaments and tendons for over 25 years. Because the Rota-Lok is a synthetic device, there are no risks or availability problems as encountered with allograft tissue. Likewise, there is no donor site morbidity as encountered with autograft tissue. The undulating structure of the strong thin corded ends means the device can be fixed with a small, secure knot that won’t slip or cause irritation to the rotator cuff tissue. The flat central open weave section of the device bridges the gap between the rotator cuff and the bone from which it detached, and encourages new tissue to grow through it. This makes the repair stronger. The width of the central open weave section reduces the likelihood of the device cutting through poor quality tissue and jeopardizing repair in the same way that sutures might. No sutures are necessary and the Rota-Lok can be used alone. The surgical procedure is quick and uncomplicated to perform, yet it is effective. The shoulder is evaluated arthroscopically to determine the size of the tear and the quality of the tissue. If the tear is small and the tissue healthy, it should be repaired with appropriate sutures and anchors. 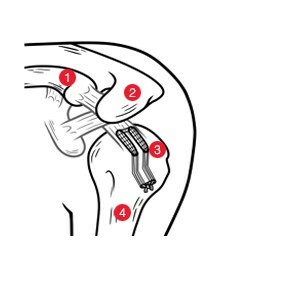 If the tear is massive or the cuff tissue has undergone extensive degeneration and the rotator cuff cannot be repaired by any other means, the Rota-Lok is used as outlined below. An incision approximately 5 cm in length is made at the site of injury. The Rota-Lok is passed through the soft tissue of the torn rotator cuff using surgical forceps, so that the wide open weave central section passes underneath the rotator cuff and the two ends of the Rota-Lok protrude from the top of the rotator cuff. Two parallel bone tunnels are created in the top of the humerus using a small drill. Each tunnel comprises two intersecting holes, one drilled from the top of the humeral head and one from the side, to create a curved tunnel. The two corded ends of the Rota-Lok are threaded through the two parallel bone tunnels and tensioned appropriately so that the open weave section spans the gap and the length of the repair is physiological. The cords are then tied on the outside of the humerus using a reef knot with an extra throw (triple knot). Any excess cord from the ends of the Rota-Lok is trimmed to length and the incision is closed using sutures. The arm is kept in a polysling. Active fingers, wrist and elbow movements are permitted. The arm is kept intermittently in a polysling. Gentle movement of the shoulder, both active (moving your shoulder without assistance) and passive (the physiotherapist moves your shoulder for you without assistance from you), is allowed. Stitches are removed if the wound is healing well. Active assisted exercises, where the patient performs the exercises with some assistance or support from the physiotherapist, are appropriate at this stage. Isometric exercises, where the patient performs the exercises against a fixed surface (e.g. by pressing their hand against the wall to immobilize and provide resistance to the muscles in the shoulder), are also begun. Scapular stabilization exercises are commenced, with gradual progression to resistance exercises, or strength training. It is important to strengthen and stabilize the scapula (shoulder blade) as part of rotator cuff rehabilitation, as it is a central structure within the shoulder. 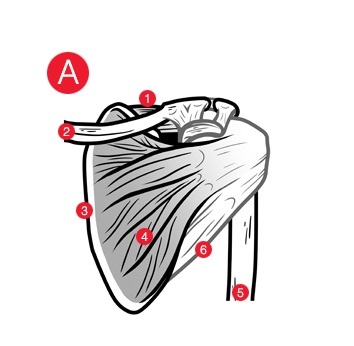 It provides attachment for three different groups of muscles, one of which is the rotator cuff, and for each set of muscles to be able to function properly without strain the foundation must be stable. 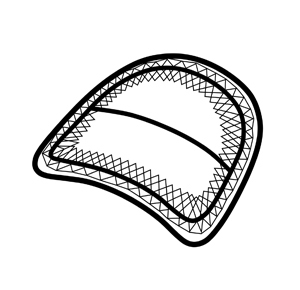 The Leeds-Kuff Patch product and technique was developed in conjunction with Mr. R. G. Hackney of Chapel Allerton Hospital. The Rota-Lok product and technique was developed in conjunction with Mr. A. M. Nada of Nevill Hall Hospital.